Helen E.S. Nesadurai is Professor of International Political Economy at Monash University Malaysia where she is also the Head of the School of Arts and Social Sciences. Originally trained in biochemistry, she holds an MSc in Economics for Development from the University of Oxford and a PhD in Politics and International Studies from the University of Warwick. 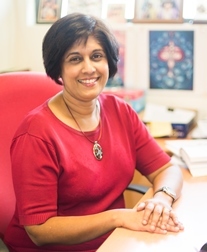 She spent fifteen years in policy research with the Malaysian think-tank, the Institute of Strategic and International Studies, before moving to academia, first to what is now the Rajaratnam School of International Studies at Nanyang Technological University in Singapore and then to Monash University Malaysia in 2006. She is well known for her research on regional integration, governance, and institutional architectures in East Asia, and especially for her work on the Association of Southeast Asian Nations (ASEAN). This work broke new ground through its theorisation of developmental regionalism as a third model of the globalisation-regionalism relationship, a form of regionalism that results when domestic political elites in developing countries design regional integration to facilitate the regional expansion of domestic private and national capital, thus securing national developmental priorities and coalitional interests in the face of global competitive pressures. Her more recent work explores transnational governance as a new mode of authority in world politics, including the specific case of private standards for sustainable palm oil. Funded by a Monash-Warwick Alliance grant and with Professor Shaun Breslin of Warwick University, she led a team of scholars to explore the varied architecture, drivers and progressive potential of transnational governance initiated by non-state actors across five sectors of importance to the political economy of Southeast Asia. This work has been published in a special issue titled Who Governs and How? Non-state Actors and Transnational Governance in Southeast Asia in Journal of Contemporary Asia (2018, co-edited with Shaun Breslin). Professor Nesadurai is currently serving a second four-year term on the Advisory Committee of the Belgium-based UNU-Institute on Comparative Regional Integration Studies (UNU-CRIS), a research and training institute of the United Nations University. She is also an associate of Warwick University's Centre for the Study of Globalisation and Regionalisation (CSGR), the Asia Research Centre at Murdoch University in Australia, and the Graduate Research and Development Network on Asian Security (GRADNAS) at the Australian National University. She also sits on the editorial boards of various academic journals and publishers and has served as Chief Editor (with Jeffrey Wilson) of the journal Contemporary Politics during 2017-2018. She has consulted for the ASEAN Secretariat and the Asian Development Bank. Helen Nesadurai’s research essentially explores the actors and processes through which international and transnational governance arrangements emerge and evolve. In her work on regional integration and governance, she has directed attention to the crucial role of domestic-level dynamics and how these interact with external, including global forces to shape the complex and multilayered regional institutional architecture in East and Southeast Asia. Her theorisation of developmental regionalism, which paid attention to such dynamics, broke new ground in the study of the relationship between globalisation and regionalism, and was published as Globalisation, Domestic Politics and Regionalism by Routledge (2003). Her other works on regional governance and integration include ASEAN and Regional Governance after the Cold War: From Regional Order to Regional Community? (The Pacific Review) and Hanging Together, Institutional Design, and Cooperation in Southeast Asia: AFTA and the ARF (with Yuen-Foong Khong), the latter part of a multi-author study comparing the design and effectiveness of regional institutions across the world led by Amitav Acharya and Alistair Iain Johnstone and published by Cambridge University Press as Crafting Cooperation: Regional International Institutions in Comparative Perspective. She continues to maintain an interest in studying regional institutions, governance and integration in Southeast Asia, and was invited in 2017 to write a review article exploring ASEAN’s progress on regional governance and community building that was published in The Pacific Review. Her more recent work moves beyond state-based institutions and forms of authority to explore non-state modes of governance and authority in world politics. While she continues to emphasise the importance of integrating the national/local when analysing transnational governance regimes developed by non-state or private actors, she also emphasises the analytical value of integrating a non-territorial conception of the global into these analyses. Using the case of primary commodity governance and private sustainable palm oil standards, she has examined how norm contestation and resistance drives normative change in world politics, published as Contesting Private Sustainability Norms in Primary Commodity Production: Norm Hybridisation in the Palm Oil Sector in the Routledge book Norm Antipreneurs and the Politics of Resistance to Global Normative Change edited by Alan Bloomfield and Shirley Scott. She has also used the palm oil case to examine the conditions under which transnational private regulation might catalyse developmental interventions by private actors, published as Transnational Private Governance as a Developmental Driver in Southeast Asia: The Case of Sustainable Palm Oil Standards in Indonesia and Malaysia in Journal of Development Studies. Transnational Private Regulation and Multi-level Governance in Southeast Asia: Investigating the Possibilities and Limitations for “Progressive” Governance (A Monash-Warwick Alliance funded project, 2014/2015, with Shaun Breslin). This project examined transnational governance in Southeast Asia, essentially cross-border networked forms of coordination in which non-state or private actors play important or leading roles in providing standards, rules and practices that other actors voluntarily abide by. The project was prompted by the Chief Investigators’ belief that there is an under-estimation of transnational governance in Southeast Asia and the varied governance role played by non-state actors that go beyond that of simply acting as pressure or advisory groups lobbying or advising states and regional organisations. The project brought together a team of scholars who provided different case studies that explored in detail the varied governance roles played by non-state actors, revealing interesting variations in the architecture of transnational governance, why they emerge, the modes of social coordination through which they work to shape actor behaviour and achieve impact, their normative implications, and how these governance schemes intersect with the state and national regulatory frameworks. The final outcome was a 2018 Special Issue titled Who Governs and How? Non-state Actors and Transnational Governance in Southeast Asia in Journal of Contemporary Asia. Transnational Civil Society, the Market and Governance Reform in Southeast Asia (2016-2017). This project compared civil society’s ability to drive reformist and transformational change in governance in two distinct spaces - ASEAN and transnational private governance - the former with a strong state presence and the latter without. For the analysis on ASEAN, rather than attempt an exhaustive survey, the study focused on human rights and environmental/forest governance, two issue areas that have seen considerable civil society activism. Private governance of palm oil sustainability is examined as it is the most advanced example of transnational private governance in Southeast Asia addressing also environmental/forest governance and human rights. The study shows that the shadow of the state, which overwhelmed ASEAN civil society space, prevented civil society actors from meaningful participation opportunities in ASEAN and a chance at contesting official policy. In contrast, strategic alliances forged between global NGOs, downstream corporations and global palm oil plantation corporations created important leverage nodes that led to significant on-the-ground changes through private governance while the absence of a formal role for state actors in private governance allowed NGOs and their allies the leeway to strengthen and expand regulatory standards for palm oil within a decade. Civil society may be able to drive change, but not just from working within civil society space but through strategic engagements with actors outside civil society in the market and out of the shadow of the state. This study was published as a chapter in the third edition of Contemporary Southeast Asia (Palgrave, 2018) co-edited by Alice D. Ba and Mark Beeson. Contesting Private Sustainability Norms in Primary Commodity Production (part of a larger study on resistance to global normative and legal change led by Alan Bloomfield and Shirley Scott that received funding from the International Studies Association Catalytic Grant Scheme, 2014). The point of departure for the overarching study was that resistance to normative change has not received sufficient theoretical or empirical attention in the constructivist literature on norms in International Relations, which has focused overwhelmingly on norm entrepreneurs. This particular project on private sustainability norms found that making a distinction between norm entrepreneurs, norm resistors and a third category of norm antipreneurs developed by the study’s co-leads is useful in examining norm contestation as a dynamic process and in explaining the varied outcomes of resistance to normative change. The overall study was published as a Routledge edited book titled Norm Antipreneurs and the Politics of Resistance to Global Normative Change edited by Alan Bloomfield and Shirley Scott. In this book, this project’s results are set out as a chapter titled Contesting Private Sustainability Norms in Primary Commodity Production: Norm Hybridisation in the Palm Oil Sector. The ASEAN Institutional Architecture (funded by the Asian Development Bank, 2011/2012). This project on ASEAN institutions was part of a larger multi-author study examining barriers and impediments to realising the ASEAN Economic Community (AEC) by 2015, commissioned by the Asian Development Bank and led by the Institute of Southeast Asian Studies (ISEAS), Singapore. The larger study brought together a team of scholars working on individual research projects that examined respectively non-tariff barriers, services trade, investment, dispute settlement, ASEAN’s various free trade areas, and competition and intellectual property law in addition to the study of the ASEAN institutional architecture. The final outcome of the larger study was a 2013 edited book titled The ASEAN Economic Community: A Work in Progress, published by ISEAS in which this project’s analysis and results are set out in a chapter titled Enhancing the Institutional Framework for AEC Implementation: Designing Institutions that are Effective and Politically Feasible. Helen Nesadurai’s teaching expertise covers International Political Economy, International Relations, Development and Global Governance. She has taught on undergraduate and postgraduate programmes, both at Monash University Malaysia and at Nanyang Technological University in Singapore where she worked previously. Her teaching approach is based on the simple, yet effective philosophy that to support student-centred learning, teachers must first spark students’ interest in the subject at hand and then help them develop both the desire and skills to probe beneath the surface of things, to question constantly and see things differently and empathetically, and to generate innovative solutions that are effective, fair and ethical. Towards this end, she brings her research expertise and her experience as a think-tank analyst and consultant on various projects to demonstrate the intricate linkages between academic study in the classroom and the messy and complex real world out there. She has won six awards for teaching and designing new subjects, awarded by Monash University and Monash University Malaysia. Her experience is not only as an educator but also in education leadership. She led the course review of the Bachelor of Communication undergraduate degree programme and the PhD graduate research programme, which led to their re-accreditation by the University and the Malaysian Qualifications Agency (MQA). Externally, she has served on Boards of Study for various postgraduate courses at University Malaya, namely the Master of International Development, the Master of Research (Economics) and the Master of Research (Public Administration). She has also served on the Curriculum Design Review Panel at Sunway University for a new Master’s level course. Breslin, Shaun and Nesadurai, Helen E.S. (2018) (Guest Editors) Special Issue on Who Governs and How? Non-state Actors and Transnational Governance in Southeast Asia, Journal of Contemporary Asia, 48 (2). Nesadurai, Helen E.S. (2018) ‘Transnational Private Governance as a Developmental Driver in Nominally Developmental States: The Case of Sustainable Palm Oil Standards in Indonesia and Malaysia.’ The Journal of Developmental Studies, (online first view). https://doi.org/10.1080/00220388.2018.1536262. Nesadurai, Helen E.S. (2018) 'New Constellations of Social Power: States and Transnational Governance of Palm Oil Sustainability in Southeast Asia.' Journal of Contemporary Asia, 48 (2): 204-229. https://doi.org/10.1080/00472336.2017.1390145. Breslin, Shaun and Nesadurai, Helen E S. (2018) 'Who Governs and How? Non-state Actors and Transnational Governance in Southeast Asia', Journal of Contemporary Asia, 48 (2): 187-203. https://doi.org/10.1080/00472336.2017.1416423. Nesadurai, Helen E. S. (2017), ‘ASEAN Environmental Cooperation, Transnational Private Governance and the Haze: Overcoming the “Territorial Trap” of State-Based Governance?’ TRaNS: Trans-Regional and -National Studies of Southeast Asia, 5 (1): 121-145. https://doi.org/10.1017/trn.2016.25. Nesadurai, Helen E.S. (2013) ‘Food Security, the Palm Oil-Land Conflict Nexus and Sustainability: A Governance Role for a Private Multi-Stakeholder Regime like the RSPO?’, The Pacific Review, 26 (5): 505-529. Nesadurai, Helen E.S. (2013) ‘ASEAN/East Asia and Global Economic Governance: Reasserting the State as Market Actor’, Studia Diplomatica: The Brussels Journal of International Relations, LXVI (1): 51-70. Nesadurai, Helen E. S. (2013) ‘Malaysia’s Conflict with the Philippines and Indonesia over Labour Migration: Economic Security, Interdependence and Conflict Trajectories’, The Pacific Review, 26 (1): 89-113. http://dx.doi.org/10.1080/09512748.2013.755360. Nesadurai, Helen E.S. (2018) 'Transnational Civil Society, the Market and Governance Reform in Southeast Asia,' in Alice D. Ba and Mark Beeson (eds), Contemporary Southeast Asia (3rd edition)(London: Palgrave), pp. 198-214. Nesadurai, Helen E.S. (2018) 'The Global-Local Nexus and the Transnational Governance of Palm Oil Sustainability,' in Andreas Goldthau, Michael F. Keating and Caroline Kuzemko (eds), Handbook of International Political Economy of Energy and Natural Resources (Cheltenham UK: Edward Elgar). Nesadurai, Helen E.S. (2017) ‘Contesting Private Sustainability Norms in Primary Commodity Production: Norm Hybridisation in the Palm Oil Sector’, in Alan Bloomfield and Shirley V. Scott (eds), Norm Antipreneurs and the Politics of Resistance to Global Normative Change (London and New York: Routledge), pp. 159-176. Nesadurai, Helen E. S. (2015) ‘Enhancing the Institutional Framework for AEC Implementation’ in Ooi Kee Beng (ed. ), The Third ASEAN Reader (Singapore: ISEAS), pp. 231-236. [Note: This is a reprint of a 2013 book chapter in the edited volume titled The ASEAN Economic Community: A Work in Progress published by ISEAS]. Nesadurai, Helen E S (2014) ‘The Political Economy of Southeast Asia’s Foreign Economic Policies and Relations’ in Rosemary Foot, Saadia Pekkanen and John Ravenhill (eds), The Oxford Handbook of the International Relations of Asia (Oxford: Oxford University Press, pp. 217-240). Nesadurai, Helen E.S. (2014) ‘Civil Society and Land Conflicts in Southeast Asia: Navigating between National, Regional and Transnational Governance’, in Lozenzo Fioramonti (ed. ), Civil Society and World Regions: How Citizens are Reshaping World Regions in Times of Crisis, (Lanham, USA: Lexington Books, pp. 107-121). Nesadurai, Helen E. S. (2013) ‘Enhancing the Institutional Framework for AEC Implementation: Designing Institutions that are Effective and Politically Feasible’ in Sanchita Basu Das, Jayant Menon, Rodolfo Severino and Omkar Lal Srestha (eds), The ASEAN Economic Community: A Work in Progress(Singapore: Institute of Southeast Asian Studies, 411-41). Potential areas of supervision include the study of international cooperation, global governance, regionalism, transnational governance and multi-level governance, with a focus on Southeast Asia and more broadly in East Asia and the Asia-Pacific. Post-colonial contestation in Malaysian and Singaporean imaginations. Graduate Chemistry Gold Medal, Institute of Chemistry Malaysia, 1982.